Excellent adhesion to wood, fabric, most plastics, ceramics and light gauge metals. Open time approx 45 seconds. 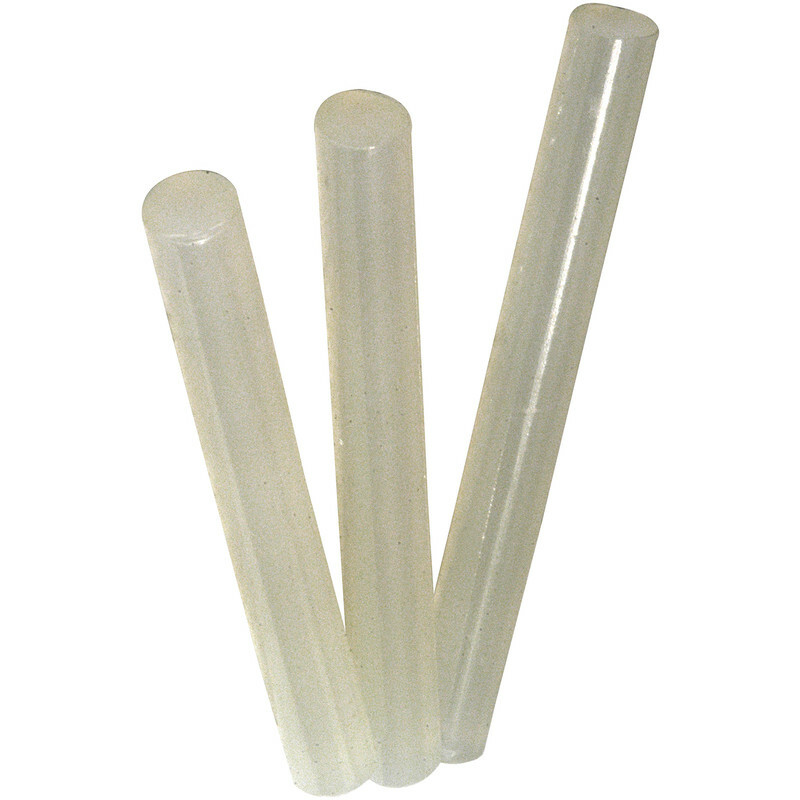 Glue Sticks 11 x 100mm (50 Pack) is rated 4.9 out of 5 by 19. Rated 5 out of 5 by Eyeball Animal from Strong bond First use of glue gun and sticks and worked well, stuck fence spikes to metal gate post bracket where it couldn't be screwed in. Does not feel like it's going to move any time soon. Only issue is that due to the short length it needed 2 to be inserted into gun to get it to load itself. Rated 5 out of 5 by Idarpe from Replacement glue sticks Very impressed with these. As good as or better than the original. Perfect! Very happy. Rated 5 out of 5 by Nick W 007 from Very sticky Great price, great product. Ta. Rated 5 out of 5 by Mike in London from Good value for money Not much to say about glue stick. Do the job. I use glue sticks to hold things in place, like wall/ electrical conduit while filler sets or tile edgings etc.. Rated 5 out of 5 by JohnDN from Strong and great value I have been using a glue gun for about 20 years now and in the last 5 years I've been using it a lot more for building maintenance, such as bonding masonry cracks (bonds better than cement and doesn't crack) and sealing bitumen felt roofs (stronger and more heat resistant than bitumen), however to get the best bond I use a heat gun (set to plastic forming lower temp) to heat the surfaces before applying the hot glue or after to tool it with a filling knife that I also heat up. I've become skilled at doing this and can do very tidy and long lasting repairs to masonry and roofs etc. These glue sticks have shown to be very strong yet still flexible and are great value, however like most other polyester based hot melt glue, it turns yellow dries and cracks in UV and in intense sun this can be as quick as 3 to 6 months. The solution is to cover it with a water-based coating (as it reacts to spirit based, hence white-spirit can be used to clean it off), such as a water-based primer-undercoat (can then be painted over with spirit based), or a water based bitumen coating (there is a good one now) or masonry paint etc. I use these hot melt sticks on so many repairs now, even during the wet and freezing winter months they make it much easier.